Weighted Logic is one of the most advanced lead distribution options available within the boberdoo lead system. 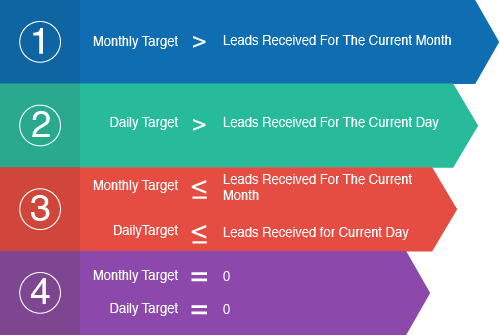 Weighted Logic allows you to prioritize lead buyers and their filter sets using a monthly and/or daily target that is constantly updated based on the number of leads each filter set has received. This allows you to automatically calculate and weigh each filter set with the greatest need as soon as a lead hits the system. Because of this, you can distribute your leads to your buyers at a consistent, designated pace. For a full explanation, visit our weighted logic page. This page is dedicated to explaining the standard priority tree that is used to sort and prioritize the filter sets before each lead is sold. Keep in mind that all existing filter set rules still apply when using weighted logic. The Match Priority setting still takes precedent over the Weighted Logic Priority Tree below. Additionally, filter settings such as daily, weekly or monthly lead limits, Days/times you accept leads and Exclusivity settings still govern the eligibility of each filter set. The priority tree below sorts all matching, active filter sets that belong to the same filter set Match Priority. *The lowest Distribution Percentage (between the Monthly and Daily Distribution Percentages for each filter set) is chosen to represent each filter set. These filter sets are sorted low to high by the respective Daily or Monthly Distribution Percentage.